Free agent Lawson D’Ath remains confident he will find new employment soon after being released by Luton last week. 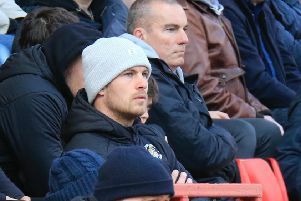 The midfielder, who played 26 times, scoring once during his 18 months at Kenilworth Road, said: “There’s three or four teams, so I’m just waiting on a few things. “When you’re out of contract, you’re just waiting, we’ll see what happens. It will hopefully be done within the next couple of weeks or so. D’Ath was quick to praise Town for their help in his quest to join a new club though despite not offering him the chance to extend his stay with the club, saying: “It’s (being out of contract) a bit rubbish, but Nathan (Jones) and Mick Harford have helped me loads. Although D’Ath was sidelined by injury this term, restricted to just 13 games, he doesn’t think that will affect his chances of playing regularly elsewhere and can’t wait to get back to playing regularly, wherever that may be, adding: “The bright side of it, I know my injuries aren’t muscle injuries. I’m just praying that I’m fit and healthy and give my all for the next club I play for really. “I rolled my ankle and my medial was an impact injury, it’s not your hamstring tearing, that’s a big worry when that starts happening. “But I’ll go on holiday next week, chill out, see friends and family that I haven’t really seen because I’ve been living away, then start working back into it in the first week of June and then building back into it slowly ready for pre-season. “Yes, I am looking forward it it, I hate it still, even though I’m looking forward to it, no matter what any player says, I hate it. “You just know you’re going to be in for a hard time, you love it and hate it at the same time, it’s like a love hate relationship.